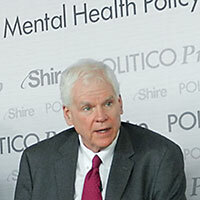 The push to improve America’s mental health policy is facing plenty of obstacles on Capitol Hill, despite the recent clamor about the need for new mental health legislation in the wake of gun-law debates, members of a panel organized by Politico newspaper agreed in a public discussion earlier today. The panel consisted of James H. Scully Jr., M.D., APA’s medical director and CEO; C. Edward Coffey, M.D., CEO of behavioral health services at Henry Ford Health System; Philip Wang, M.D., deputy director of the National Institute of Mental Health; and two members of Congress, Rep. Jim McDermott (D-Wash.) and Rep. Phil Roe (R-Tenn.), who were practicing physicians before being elected. McDermott is a psychiatrist. Recent high-profile shooting incidents, particularly the tragic Newtown school massacre, again brought mental health issues to the forefront of political debate, reigniting pushes for health care policies that foster increased mental health care access. The panelists agreed that nearly five years after the mental health parity law was passed, the insurance industry is still dragging its feet implementing it, thanks largely to the government's delay in passing relevant regulations to guide implementation of the law's provisions. The panel hastened to note that most violence, gun-related or not, is not committed by people who are mentally ill. In addition, when people with mental illness resort to gun-related violence, they usually direct it at themselves, McDermott pointed out. However, despite a well-documented need, access to high-quality, integrated care is lacking for many Americans, Scully emphasized. Without payments for mental health care that are on par with those for other medical services, however, better mental health care cannot be brought to those who need it, he pointed out. To view a video of the Politico panel discussion, click here.